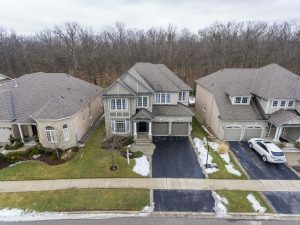 Elite3 and Team are pleased to inform you that we have a new listing: 2128 Bingley Cres, Oakville and the list price is $1829,000. 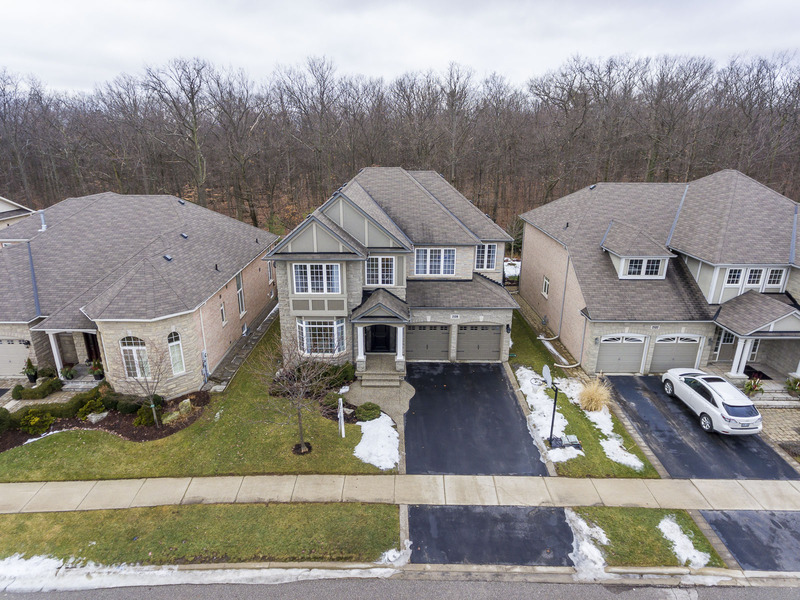 Built in 2008 on a large lot backing onto Bronte Creek Provincial Park, 2128 Bingley Crescent is a beautiful four-bedroom, five-bathroom family home. This unique 3064 sqft home boasts nine-foot ceilings and eight-foot doors on the main floor and second floor, three gas fireplaces, and a main floor office. Each room is thoughtfully designed to be luxurious, comfortable, and sophisticated. Dark oak hardwood floors, crown moulding, and oversized baseboards give the main floor a classic, timeless appeal. French windows are featured in the living room and office, and recessed ceilings create a spacious and bright atmosphere in the dining room. The open concept family room features a wall of windows that overlook Bronte Creek Park and a custom fireplace with a beautiful stone hearth. The kitchen is the main attraction on this floor. The double-level centre island is surrounded by granite countertops, travertine backsplash, and white cabinetry. The appliances are all stainless steel and top-of-the-line, and the oversized Kindred sink is extremely beneficial. The adjacent breakfast area is bright and full of natural light, with travertine floors and bench seating. The upper level boasts dark oak hardwood floors, large French windows, and three custom art niches. Double doors lead to an elegant master bedroom, with a gas fireplace, marble surround, and wooden mantel. The six-piece ensuite bathroom features floor-to-ceiling tiles on all walls, double sinks, an oversized soaker tub, a separate shower room, and his & hers walk-in closet. The second bedroom boasts two large closets and a four-piece ensuite bathroom, while the third and fourth bedrooms share a Jack and Jill bathroom. Down the hall, an additional room serves as a cozy den or study room, with tall French windows that overlook the front yard. Downstairs, the basement is professionally finished and spacious. Oversized windows bring in lots of light, a unique feature that isn’t featured in most basements. The custom wet bar with granite countertops is perfect for entertaining, and the gas fireplace surrounded by floor-to-ceiling marble gives an elegant yet comfortable feel. The professionally landscaped backyard is private and features a large stone patio. Towering oak trees have surrounded the area for almost one hundred years, and the proximity to Bronte Creek Provincial Park makes you feel one with nature. Bingley Crescent is a quiet, family-friendly street in Oakville’s Palermo West neighbourhood. Driving to top-rated Garth Webb Secondary School is only 6 minutes. The Palermo West neighbourhood is known for its many parks and walking trails, such as Fourteen Mile Creek, Valleyridge Park, and Colonel William Woods Parkette. Deerfield Golf Course and Glen Abbey Golf Club are just a short drive away, and this area also benefits from close access to Oakville Trafalgar Memorial Hospital.